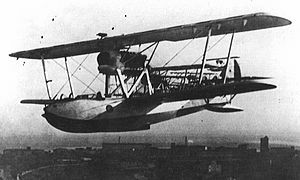 The SM.62 flying boat was one of the main successes of Savoia-Marchetti, evolved from the SM.59 which first flew in 1925. The single-engine, single-spar wing, wooden biplane aircraft was powered by a single Isotta-Fraschini Asso 500RI, 373 kW (500 hp) engine mounted between the upper and the lower wings, and drove a pusher propeller. It had a wingspan of 15.5 m (50.8 ft), a maximum takeoff weight of 3,000 kg (6,610 lb) including fuel, bombs and four crew, and entered production in 1926. Apart from the two machine guns in the aft and forward fuselage, both mounted in uncovered positions, the possibility of fitting an 20 mm Oerlikon cannon was explored, but never put into service. The progress of the project was almost continuous, and the following year saw the SM.62bis development that had a more powerful engine. This aircraft, with a 16 m (52.4 ft) wingspan, formed the basis of the future SM.78. The new 559 kW (750 hp) Isotta Fraschini Asso engine produced 50% more power, which allowed a maximum take-off weight of 4,000 kg (8,818 lb) with a maximum speed of 220 km/h (140 mph), while the range was 1,200 km (746 mi). For those times, these were respectable performance figures for a single-engine aircraft. The SM.62 was one of the first Italian racing- and world-record attempting aircraft, competing in the 1926 New-York to Buenos Aires air-race and the 10,000 km (6,210 mi) air-race in northern Europe, in addition to setting the speed records of 190.537 km/h (118.394 mph) averaged over 500 km (310 mi) in 1926 - later augmented to 194.237 km/h (120.693 mph) - and the world records flying 500 km (310 mi) while carrying 500 kg (1,100 lb), and finally 100 km (60 mi) and 500 km (310 mi) with 1,000 kg (2,200 lb). This was the most successful Italian flying boat outside Italy, with at least one being acquired by Japan for its naval aviation service, several by Romania, and 40 by Spain, some of which were license-built. The USSR acquired the license to construct the SM.62bis in Taganrog plants as the MRB.4, with many examples built. Despite their obsolescence, several Spanish examples fought in the Spanish Civil War. Since the aircraft of those times were not capable of great speeds, several were used at the Desenzano "high-speed flying-school" in Italy, as well as continuing to serve as reconnaissance-bombers. The next derivative, the SM.78, with over a ton more weight and 20% more power; could carry a greater fuel load, effectively doubling the range; and was slightly faster than the SM.62bis. There were no SM.78bis; the succession was interrupted by the introduction of the CANT Z.501. 600 kg (1,323 lb) of bombs. Lembo, Daniele SM.78, Storia Militare N.19, Westward editions, pagg. 43-49.